The Deco, a stunning handmade curved front solid brass, flush fitting period outdoor wall lantern with Art Deco features. The front lens is made from flexible impact resistant polycarbonate sheet. The Deco outdoor wall lantern is made from a light antique finish solid brass, is rated IP23 and suitable for outdoor use. Supplied with a frost and vandal resistant curved polycarbonate lens. 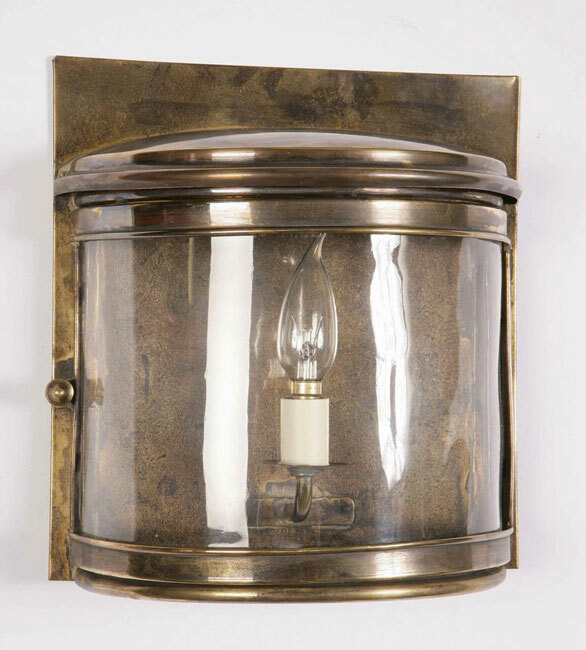 From our solid brass replica period outdoor lighting selection. Each replica outdoor wall light is handmade in the UK making every one unique. As these are made to order, please allow 4 weeks for your delivery. Also available in a polished brass, aged and bronze finishes. Handmade and finished to order. Timeless replica lighting made to last a lifetime.